From his prolific solo work, to his prominent membership in the supergroup Praxis and rock legends Guns N' Roses, Buckethead embodies one of the most fiery, creative personas of our times, and has continually affirmed his stance in the upper echelon of contemporary shredders. Equally attention-grabbing as his incendiary chops, Buckethead's stage show and visual presence remain unique among the rock field, and his Gibson guitars”a white Les Paul in particular”have always been a big part of that. The Gibson Buckethead Signature Les Paul celebrates this unparalleled artist's achievements. With an oversized, chambered Les Paul body, a marker-less ebony fingerboard, and Buckethead's choice of Gibson's contemporary ceramic humbucking pickups”complete with modified electronics and "arcade" style kill switches”this is a Les Paul guitar like no other. It's primed to get you noticed, and designed for utmost performance for the contemporary rock, metal, and shred performer. Each Buckethead Signature Les Paul is crafted from a 2-piece maple top attached with ultra-strong Franklin Titebond 50 glue to a chambered mahogany body. This wood combination, one of the most acclaimed pairings in the history of the solid and semi-solid electric guitar, yields a "best of both worlds" tonal splendor. With the great clarity, definition and treble bite from the maple, and excellent depth and richness from the mahogany, elements found in the classic Les Paul Standard tone. The chambering adds a further dimension, increasing the complexity of this guitar's tone, while also increasing its acoustic volume and sustain. 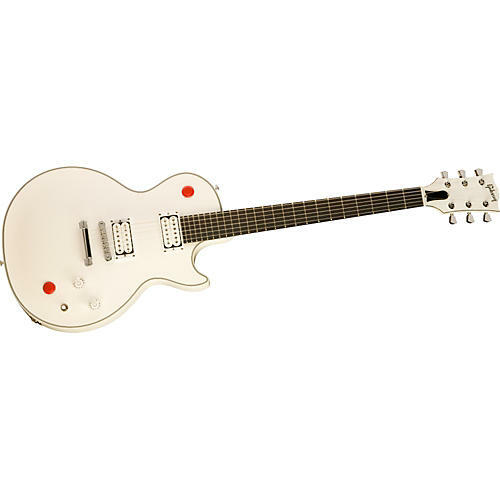 Reflecting Buckethead's continued departure from the norm, the Buckethead Signature Les Paul looks outwardly much like a slightly modified white Les Paul Standard, but had been made with an oversized, chambered body. The chambered mahogany back serves to minimize weight, while also adding tonal nuances to the guitar's overall sound. The Gibson Buckethead Signature Les Paul is finished in high-gloss Alpine White which is complemented with a stunning black and white 5-ply binding. These give this unique electric guitar a sleek, contemporary appearance and a smooth, fast playing feel. The neck of the Gibson Buckethead signature guitar is constructed from a single piece of solid mahogany, and glued to the body at a 4-degree angle (pitch). Mahogany is a traditional neck wood that is prized for its combination of lightness and strength. Buckethead's Signature Les Paul neck is carved to its own custom profile that runs from .870" at the nut to .955" at the 12th fret, and is designed for the ultimate combination of speed and comfort. The Buckethead Signature Les Paul features a 27" scale length which increases neck tension for improved accuracy and precision and allows for the lower tunings used in modern rock music. The Buckethead Signature Les Paul is equipped with a Grade-A ebony fingerboard, which enhances note attack and articulation. The 12" radius of the Les Paul fingerboard provides smooth note bending capabilities and eliminates "dead" or "choked out" notes, common occurrences on fingerboards with lesser radiuses. The Gibson Les Paul sports 24 jumbo frets that are immaculately dressed and polished. It carries no inlays, echoing the stark, contemporary look that this artist is known for. The Buckethead guitar carries a calibrated pair of Gibson's contemporary-voiced Ceramic series humbucking pickups, featuring a 496R Hot Ceramic in the neck (rhythm) position, and a hot 500T Super Ceramic in the bridge (lead) position. Both are specially made with double-white bobbins to match the look of the guitar, and the bridge pickup is split via a push/pull switch on the Tone knob to achieve a single-coil tone. Ceramic magnets provide a clear, bold performance with plenty of output, without the need for packing on more coil windings than the pickup design can handle. The 496R Hot Ceramic in the neck position offers unparalleled creamy sustain that nevertheless retains excellent cutting power. Its partner, the 500T Super Ceramic, is one of Gibson's 2 hottest pickups, intended for ultimate wailing lead tones, sustain, and searing cutting power in the bridge position. Between them, they present excellent sonic versatility and impressive contemporary tones. This pair is also well-matched for balanced output levels in all switch positions. The Gibson Buckethead Signature guitar comes equipped with a Tune-O-Matic bridge and tailpiece made from lightweight chrome-plated Zamak and respectively weigh approximately .118 lb. and .168 lb. The Tune-O-Matic adjustable bridge provides a firm seating for the strings, allowing the player to adjust and fine-tune the intonation and string height in a matter of minutes. It also yields excellent coupling between strings and body, maximizing resonance, tone, and sustain. This Gibson Les Paul carries 2 red "arcade" style push-button kill switches to mute the output of the guitar, as well as a push/pull switch on the Tone potentiometer to access the bridge pickup's split-coil feature. The headstock of the Buckethead Les Paul is equipped with chrome-plated locking Grover keystone tuners with an advanced 18:1 gear ratio for increased efficiency. The Buckethead Signature comes protected in one of Gibson's durable black, hardshell cases with Gibson logo silk-screened across the front in white lettering. Case: Durable black hardshell Gibson logo silkscreened across the front in white lettering.